ABSTRACT Flexibility is one of the meaning of the construction of verbs in Arabic, that can be done by using certain balance of rules. The meaning of the flexibility cannot be achieved except with its existence. The linguists stated on these rules, detailed the talk, and gave their examples and poetic and prosy evidences – as they did. But, the examples they gave of the holy Koran for the flexibility didn't apply in its construction with of those rules in the books of language and morphology in the past and at present, wher5eas the linguists conditioned for the flexibility two verbs derived both from one root combined with the letter "f" such an this form didn't exist in the holy Koran, and the research discusses this problematic through defining the meaning of flexibility, mentioning its rules, them approximation the morphological base in the books of the ancient people and modern with the examples occurring in the Holy Koran with who sees their occurring in it, and the evidence of one doesn't see the truth of that by the modern ones, especially, through reviewing the most important linguistic and morphological sources then approximation its relevant approximation with the Holy Koran text. ABSTRACT Repetition is considered one of the linguistic methods adopted by the poets in their poems since ancient times, as we find pictures of recurrence in pre-Islamic poetry, varied with the diversity of poetic purposes in which the poets composed. The use of repetition was not limited to the pre-Islamic poets only, but it's use also extended to all poetic ages until the present day. Redundancy in the poem is completely different from repetition in everyday speech, which is nothing more than to be assertive of what was said, but in the poem, it plays an important role in raising the aesthetic values in creative work. Repetition in Mudhaffar Al-Nawab's poem is many and varied, but we decided to study the phenomenon of repetition in the poem (Fe'alun Mabni Lilmajhool) the fact that this poem is one of the modern poems, organized by the mentioned poet in recent years, particularly after the U.S. occupation of Iraq. This poem is full of many types of repetitions deserve to be stopped at, as it varied from repeating character, word, phrase, and methods, reaching to repeating the section. Also the poem was based on paradox method, which all his poems are based on. In paradox, he is always ironic and sarcastic. ملخص البحث يعد التكرار من الأساليب اللغوية التي اعتمدها الشعراء في شعرهم منذ القدم، إذ نجد صوراً للتكرار في الشعر الجاهلي، تنوعت بتنوع الأغراض الشعرية التي نظم فيها الشعراء. ولم يقتصر استخدام التكرار على الشعراء الجاهليين فحسب، بل امتد استخدامه إلى جميع العصور الشعرية حتى وقتنا الحاضر. والتكرار في الشعر يختلف تماماً عن التكرار في الكلام اليومي الذي لا يعدو أن يكون توكيداً لما قيل، أما في الشعر فإنه يؤدي دوراً مهماً في رفع القيم الجمالية في العمل الإبداعي. والتكرار في شعر مظفر النواب كثير ومتنوع، إلا أننا ارتأينا أن ندرس ظاهرة التكرار في قصيدة (فعل مبني للمجهول) كون هذه القصيدة من القصائد الحديثة التي نظمها الشاعر في السنوات الأخيرة، تحديداً بعد الاحتلال الأمريكي للعراق. تزخر القصيدة بأنواع عديدة من التكرار تستحق الوقوف عندها، إذ تنوعت من تكرار الحرف، والكلمة، والعبارة، والأساليب، وصولاً إلى تكرار المقطع، كما أن القصيدة اعتمدت على أسلوب المفارقة الذي لا تكاد تخلو منه قصيدة من قصائد النواب، وفي المفارقة هو ساخر ومتهكم دائماً. ABSTRACT This research aims basically to search in the theory of worker grammar when(Ibn mudhaa Qurtubi) and Grammatical and as modernists, and why choose this character for being famous personalities rebellious on the theory of factor Grammar, which has been corroborated by the ancients such as(Al Khalil) and(Sibawayh) Basra s linguists early, it has invalidated the ibn lit Theory Group and the Inspired by his doctrine of virtual jurisprudence, which invalidated the measurement and reasoning and some philosophical ideas, one of the boldest attempts accommodative in the history of Arabic grammar, but modernists was the first of whom Ibrahim Mustafa in his book (the revival of grammar) and followed(Ahmed Abdel Sattar Aljwary) and (Mehdi Makhzoumi) and (Shawqi dhaif) in some of his views (Tammam Hassan) who tried to put theory clues contextual replace the theory of employment, the right that the theory of factor authentic rooted in the Arabic grammar and could not who rebelled should change something but they could not nullification because of the weight of the Great in Arabic, as well as some opinions facilitation of attempts wonderful to facilitate the Arabic grammar. ملخص البحث يهدف هذا البحث في الأساس إلى البحث في نظرية العامل النحوي عند ابن مضاء القرطبي وعلماء اللغة والنحو المحدثين, والسبب في اختيار هذه الشخصية كونها من أشهر الشخصيات الثائرة على نظرية العامل النحوي التي أثبتها القدماء كالخليل وسيبويه ونحاة البصرة الأوائل, إذ أبطل ابن مضاء نظرية العامل وذلك بوحي من مذهبه الظاهري في الفقه الذي أبطل القياس والتعليل وبعض الأفكار الفلسفية وهي من أحمد المحاولات التيسيرية في تأريخ النحو العربي, أما المحدثون فكان أولهم إبراهيم مصطفى في كتابه (إحياء النحو) وتابعه احمد عبد الستار الجواري ومهدي المخزومي وشوقي ضيف في بعض آرائه تمّام حسان الذي حاول أن يضع نظرية القرائن السياقية محل نظرية العمل, والحق أن نظرية العامل أصيلة متأصلة في النحو العربي ولم يستطع الذين ثاروا عليها أن يستبدلوها بشيء ولم يستطيعوا أن يلغوها بسبب الثقل العظيم لها في العربية وكذلك كانت بعض آرائهم التيسيرية من المحاولات الجادة لتسهيل النحو العربي. 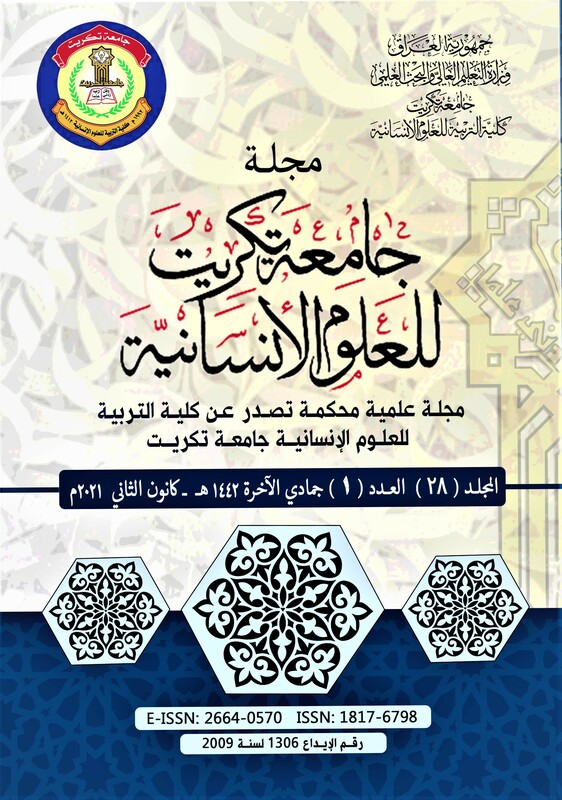 ABSTRACT The research was entitled (Curriculum of Abi Hayan Al Nahawi in his book Irtishaf Al Darb in Al Naql An Ibn Asfur"), that observes the effect of predecessor on the offspring through studying the grammatical effect of Ibn Asfur in his book Irtishaf Al Dharb an Abi Hayan Al Andalusi. The subject matter requires to be divided into eight research is about the curriculum adopted by Abi Hayan in taking from the sources of Ibn Asfur ; that comprise the direct taking from the source itself then the indirect taking by the way of (narration). The second research deals with the way depended by Abi Hayan that is the chronology of the seats when he mentions the scientists such as Ibi Asfur. The third one that he made Ibn Asfur a means for finding out the agreement of the grammarians then caring of their saying. Then, the fourth one which included his finding out the acceptances of Ibn Asfur. The fifth, his caring evidences of Ibn Asfur himself. Sixth, cases of the uniqueness deliberation. Seventh, his caring from the compositions of Ibn Asfur without reference to a certain of his books. The Eighth was about his indicating to Ibn Asfur in the misreading. The most important sources on which the research depended is the book entitled "Irtishaf Al Dharb of Abi Hayan" then the compositions of Ibn Asfur, as well as some of the others sources. Summary Search Effective address in the text narrative Study in beauty stories Nuri Jamal Nouri Iraqi writer Nonfiction born in 1958 in Kirkuk, BA in English from the University of Mosul in 1980. He has published six collections of short stories first is (the walls) in 1985 and Ojaraha (sun behind the clouds) in 2010 and the entire short stories and very short. Eating our research effectively address in the stories Jamal Nouri, what plays the role of an actor in the space of the text narrative, so we can say that title is almost dominated the construction technical map experience anecdotal, and directed Qraúaa active in drawing the attention of the receiver and tight mind to read these stories and interpreting. We focused in the search for the latter group (sun behind the clouds) because it includes stories of other groups, especially stories with titles Community anecdotal Kalpir Iraqi Guernica. Spin topics these stories about the reality of the Iraqi man, and the suffering of pain, siege and wars, and is looking forward to the hopes and freedom. Often the author is the narrator and personal hero, so it adapts writer as much as possible behind the text. The other fictional characters are stereotypical personalities of fact, and often lacks the appointment or label, giving it a theme of inclusiveness, such as father figures and mother and son and daughter and brother and so on. ملخص البحث جمال نوري كاتب قصصي عراقي من مواليد 1958 كركوك، بكالوريوس في اللغة الانكليزية من جامعة الموصل عام 1980. صدرت له ست مجموعات قصصية أولاها (الجدران) عام 1985 وأخراها (شمس خلف الغيوم) عام 2010 وكلها قصص قصيرة وقصيرة جداً. تناول بحثنا هذا فاعلية العنوان في قصص جمال نوري، لما يلعبه من دور فاعل في فضاء النص القصصي، حتى يمكننا القول إن العنوان يكاد يكون مهيمناً على البناء الفني لخارطة التجربة القصصية، وموجهاً قرائياً فاعلاً في لفت انتباه المتلقي وشد ذهنه إلى قراءة تلك القصص وتأويلها. ركزنا في البحث على المجموعة الأخيرة (شمس خلف الغيوم) لأنها تضم قصصاً من المجموعات الأخرى، خاصة القصص التي تحمل عناوين المجموعات القصصية كالبئر وغورنيكا عراقية. تدور موضوعات تلك القصص حول واقع الإنسان العراقي، وما يعانيه من آلام وحصار وحروب، وما يتطلع إليه من آمال وحرية. وغالباً ما يكون الكاتب هو الراوي والشخصية والبطل، لذلك يتماهى الكاتب قدر الإمكان وراء النص. أما الشخصيات القصصية الأخرى فهي شخصيات نمطية من الواقع، وغالباً ما تفتقد إلى التعيين أو التسمية، مما منحها سمة الشمول مثل شخصيات الأب والأم والابن والبنت والأخ وغير ذلك. SUMMARY Almutanabi was fond of diminution. He employed it in his poetry to serve his multiple poetical purposes especially praise and satire. Therefore, this study comes to shed light on this phenomenon in Almutanabi's poetry, in terms of being an optional stylistic feature. This study collects, analyzes and studies the terms of this phenomenon through pronunciation, structure, sound and meaning. Also, it studies the minimized term from a lexical view, as well as horizontally through its role on the verse level. After that it studies it vertically in the whole poem and finally in the overall work of the poet. The study ends with an applied study that handled this phenomenon in a whole poem of Almutanabi's in which the phenomenon is reflected in a plain manner. ملخص البحث كان المتنبي مُولعًا بالتصغير، يوظّفه في أشعاره ليخدم أغراضه الشعرية المختلفة ولا سيما المديح والهجاء. ومن أجل ذلك تأتي هذه الدراسة لتسلط الضوء على ظاهرة التصغير في شعر المتنبي، مِن حيث هي سمة أسلوبية اختيارية. وتقوم الدراسة على جمع مفردات الظاهرة، وتحليلها ودراستها من خلال اللفظ والتركيب والصوت والمعنى. والدراسة تدرس المُفردة المُصَغّرة من ناحية معجمية أولاً ثم تدرسها أفقيًا من خلال دورها على مستوى البيت الشعري ثم عموديًا في القصيدة بأكملها ثم في مجمل إنتاج الشاعر. وقد خُتمت الدراسة بدراسة تطبيقية عالجت الظاهرة في قصيدة بأكملها من قصائد الشاعر التي تتجلّى فيها ظاهرة التصغير. Abstract This study included four research namely: the first research dealt with definition of the crime linguistically and within the legislative term also, then its definition also in the positive law. Also, the researcher talked about the crime, aims, and its legislation in the Islamic law and law. The second research, we discussed the nature of incrimation in the Islamic law and the positive laws, therein we included only mentioning the crimes of limits with its kinds in the Islamic law, then the balance between it and the positive laws. The third research which included the second part of the crimes that is the crimes of punishments and the wergilds showing the crime of premeditated murder in the Islamic law and law, then the damaging of legs on p0urpose, also the crimes to be punished on using the wergild (blood money) in the Islamic law. In the third part we dealt with the crimes of rebuke (scolding). The fourth research dealt with principles and values on which the punishments in the Islamic laws and positive laws depend on. At the end of this research we showed the most important conclusions and the essential differences which distinguish the God's legislation from the positive laws. ABSTRACT The interest of the research ties in the stage of the Othman's ruling of the west Tripoli, that it passes through important historical stages including the direct Ottoman ruling stage extending since (1551-1711 ; whereas this stage is divided into two stages, the first one is the Berklerki's Wallis ruling extending since (1551-1606 A.D.), then the stage of Al Day at extending since (1606-1711 A.D.) the importance of the research comes through the Beklerki, the above mentioned stage, in the wake of a series of fierce batter which were launched by Spain by the support of its allies aiming at occupation of the Libyan territories because of the importance of their strategic territories joining between Europe and the source of the big wealth's in Africa and the far East across the territories of Sudan and the Red Sea. It concentration was on the city of Tripoli which was considered an old center for ruling and trade ; moreover it was the most importance and the largest of the Libyan cities which progressed through all ages in its trade since the beginning of the 16th century A.D., whereas it excelled for its good arrangement and for the beauty of its buildings on the city of Tunis wide and beautiful one. ABSTRACT The Egyptian society has suffered at the end of 19th century and the beginnings of the 20th century from long-range political, social and economic changes accelerated to demolish inherited foundations and re-formed the classes structure of the society. All this happened under the effect of the British occupation Egypt and the economic, social, and cultural policies it imposed which reached to deformed development directed abroad dependent to it. The class condition in the Egyptian society was limited among those who have and who have not on one hand, then coming of the foreign communicates working in agriculture, industry and trade on the other. Consequently, the social classes will have various productive relationships each from others. Moreover ; craft groups started to be existed, regarding as an expression of the Egyptian working class, and not to forget that the authorities of the British occupation to carry out a group of polices aiming at curbing the Egyptian national movement, the first of which employment the differentiation of the religious creed among the Moslems and Copts of Egypt itself. ملخص البحث طرأت على المجتمع المصري في أواخر القرن التاسع عشر وأوائل القرن العشرين، تغيرات سياسية واجتماعية واقتصادية بعيدة المدى عجلت بهدم العديد من المؤسسات الموروثة وأعادت صياغة التركيب الطبقي للمجتمع، وحدث هذا كله تحت تأثير الاحتلال البريطاني لمصر، وما فرضه من السياسات الاقتصادية والاجتماعية والثقافية التي آلت إلى تنمية مشوهة موجهة إلى الخارج وتابعة له. وقد انحصر الوضع الطبقي في المجتمع المصري بين من يملكون ومن لايملكون من جانب، وتوافد الجاليات الأجنبية من جانب أخر، واشتغالهم بالزراعة والصناعة والتجارة وبالتالي فان الطبقات الاجتماعية سوف تكون علاقاتها الإنتاجية مختلفة عن بعضها البعض، هذا فضلا عن قيام الطوائف الحرفية التي هي بمثابة تعبير عن الطبقة العاملة المصرية، ولا ننسى قيام سلطات الاحتلال البريطاني بتنفيذ طائفة من السياسات التي تستهدف كبح الحركة الوطنية المصرية، كان في مقدمتها توظيف الاختلاف في العقيدة الدينية بين مسلمي مصر وأقباطها. ABSTRACT Enjoying fields of operation of contemporary Islamic literature perceptions and enablers: The represented a range of elements that preserve the artistic orientation, and the perceptions are associated with intellectual Palace stemming from it, and the possibilities of Applied creativity and analytical treatments. The subject path of critical thinking with the Islamic conception of a sequence of questions the methodology on the extent the validity of this criticism to test the text and revealed the meaning and access layers significance varied diversity of reading and multiplicity, as well as its efficacy in the possibility of liberation or not the power of concentration on the same heavily exclusivity, and adorned with the establishment of barriers between us. Offering these securities perceptions scientific foundations of Islamic literature contemporary from tow Component (based cash, and based value system), starting from its courtyard monetary contemporary and shrouded in problems and crises, and outcomes and data, as well as drawing personal cash with universality, which hosts the diverse and varied creations, and learn behaviors that provide contemporary creativity. ملخص البحث تتمتع حقول اشتغال الأدب الإسلامي المعاصر بفواعل وتصورات وممكنات: أما الفواعل فتتمثل بمجموعة من العناصر التي تحفظ توجهه الفني، وأما التصورات فترتبط بالأس الفكري النابع منه، وأما الممكنات فتتحدد بفضاءات من الإبداع التطبيقي والمعالجات التحليلية. ويخضع مسار التفكير النقدي ذي التصور الإسلامي لمتوالية من الأسئلة المنهجية المتعلقة بمدى صلاحية هذا النقد لاختبار النص وكشف المعنى والوصول إلى طبقات الدلالة المتنوعة بتنوع القراءة وتعددها، فضلا عن نجاعته في إمكانية التحرر أو عدمه من سلطة التمركز حول نفسه المثقلة بالتفرد، والمزدانة بإقامة الحواجز بين عندياته ومعطيات الآخر. تقدم هذه الأوراق تصورات علمية لمرتكزات الأدب الإسلامي المعاصر واقتصر البحث على مرتكزين مهمين اثنين هما: ( المرتكز النقديّ، والمرتكز القيميّ )، بدءاً من ساحته النقدية المعاصرة وما يكتنفها من إشكاليات وأزمات، ونتاجات ومعطيات، فضلا عن رسم الشخصية النقدية ذي الصبغة العالمية، التي تحتضن لفيفاً من التوجهات والإبداعات المتنوعة والمختلفة. Abstract Ibn Asakir: Imam Hafidh Thiqat Al-Deen Abu Al- Kasim Ali bin Al-Hussien bin Hibat Allah Al-Shafy'ai died in (571 A.H 1175 A.D). He born in Damascus in (499 A.H 1105 A.D). He wrote " The Great History of Damascus" which is considered as an Islamic Encyclopedia falls in (74) volumes and an index that contains the different phenomena of Arabic and Islamic Culture. It mentioned everyone who visited Peninsula and participated in its culture since the Caliphate till the age of the author and from different regions of the Islamic World in different domains of life '' scientific, political, administrative, economic and social " This paper tries to shed light on the embassies of scientists in the era of crusades (490 – 571 A.H 1096 – 1175 A.D) from the book of "History of Damascus" to Ibn Asakir. He presented a survey with the names of the scientists who were ambassadors. The importance of this study lies in that the information that Ibn Asakir presented were his own and not taken from sources (oral or written) (i.e. he wrote what he saw) except rare cases, this was a feature belongs to Ibn Asakir himself. The study includes two sections and a conclusion. Section one deals with the definition of embassy linguistically and idiomatically. It also tackles the stages of developing embassies during Islamic Ages as well as the conditions that should be available in the ambassador. Section two studies the scientists who worked as ambassadors during the period that this paper deals with. ملخص البحث ابن عساكر: الإمام الحافظ ثقة الدين أبو القاسم علي بن الحسين بن هبة الله الشافعي المتوفى (571هـ/1175م)، ولد بدمشق سنة (499هـ/1105م) وعُرف بكتابه "تاريخ دمشق الكبير" الذي يعد موسوعة إسلامية يقع في (74) مجلدا، فضلاً عن فهرست تناول فيه مختلف مظاهر التراث العربي الإسلامي، إذ ترجم لكل من زارَ بلاد الشام وأسهم بحضارتها منذ الخليقة حتى عصر المؤلف من كل بقاع العالم الإسلامي في مختلف مجالات الحياة العلمية والسياسية والإدارية والاقتصادية والاجتماعية. وتسعى هذه الورقة العلمية إلى إلقاء الضوء على بعض سفارات العلماء في عصر الحروب الصليبية للمدة (490-571هـ/1096-1175م) من خلال كتاب تاريخ دمشق لابن عساكر، إذ أعطى ابن عساكر جرداً بأسماء العلماء الذين تبوؤا وظيفة السفير، وتكمن أهمية هذه الدراسة أن معلومات ابن عساكر عن الذين كتب عنهم جاءت من خلال مشاهداته العيانية لهم أو السماع عنهم من دون الرجوع إلى المصادر المكتوبة والمشافهة إلا في حالات نادرة ، وهي ميزة انفرد بها ابن عساكر عن غيره من المصادر الأخر المعاصرة له. وشملت الدراسة على محورين وخاتمة، تضمن المحور الأول: أ_ تعريف السفارة لغة واصطلاحاً. ب_ مراحل تطور السفارات خلال العصور الإسلامية. المحور الثاني: أ_ أهم الشروط الواجب توفرها في السفير، ب- تسليط الضوء على أهم العلماء الذين شغلوا وظيفة السفير خلال الحقبة التي تناولها البحث. ABSTRACT We can see that the Iraqi position towards the Islamic alliance contorts with that of some Arab contrite part coldly Lebanon . Never the We should printing that the position of Iraq and Lebanon did not change from a prior coordination between them in the some degree it opposes adopt and the nature of the ruling . It might instigate plot as trailed in the political change witnessed and dispute between Iraq and Iran on the regulation of Iran being a member in the Islamic alliance. الاساس في مناقب بني العباس لجلال الدين السيوطي (ت 911 هـ) "دراسة وتحقيق"
Abstract All International and Arabic libraries have the most unique Arabic historical, religious, literary and scientific manuscripts, which contain within it an endless heritage and history. They are basically in need of fathoming through considerable investigation. Now we investigate one of manuscripts of Imam Al-Suyuti (911, A H), which is the basis for Manaqib Bani al-'Abbas. Al-Imam Al-Suyuti was very interested in this manuscript for discussing the commendable characteristics and virtues of the most pure and virtuous family (Muhammed's family), whenever he gathered 40 sayings (Hadith) of the Prophet (Peace be upon him) and entitled them as (Manaqib Bani al-'Abbas) as he explained their noteworthy feats and their rights in Islam. Al-Imam Al-Suyuti investigated accurately the Prophet’s sayings (Hadiths) in this manuscript according to investigators’ method. This gave the manuscript scientific and historical position because it is linked to the sayings of the Prophet Muhammad (PBUH). According to his biography, Al-Suyuti was a well-known author; however, we have to complete this paper by focusing on his biography in terms of his birth, upbringing, scientific journeys, scientists’ praising to him and then his death. This paper is divided into two sections. The first part deals with Al-Suyuti’s biography. The second part investigates the manuscript, in which we adopted two versions , which are categorized as (A) to the original version , which is now available in The Central Library for Islamic Manuscripts in Egyptian Ministry for Islamic Affairs under the No (1823), as it consists of 8 pages , and its copyist is unknown. The second version is referred to as (B), which is available in ‘Al-Azhar Library’ in Arab Republic of Egypt, under the No (4022), which consists of (10) pages and its copyist was Mohammad Abi Al-Saud bin Mohammad Al-khafaji Al-Makkee. We have made a comparison between the two versions and show the differences between them. An accurate review has been made to the Holy Quranic Verses, Prophet’s Sayings (Hadith) and poems, as well asscrutinizing the historical narratives and the biographies of men which are accredited in original sources whether in history or the Holy Sayings of the Prophet (Peace be Upon Him). We put in mind the description of these two versions and anything on them, as it was discussed in the first part of the paper. Although, it was briefly investigated because they were few in numbers, it has a considerable significance, which requires a deep investigation and this basically forms the importance of this research. ABSTRACT The Muslim historian left for us much heritage, first of this abundant heritage what they wrote down about the fragrant biography of the prophet Muhammad (God's blessing and peace be upon him), and about the Islamic conquests. Of these historians, the jurist and historian called Abu Al Rabee' Suleiman Al-Kula'I (D. 634 A.H. – 1237 A.D.), the author of the book entitled, "Al-'Iktifa Fe Maghazi Rasulillah walthalathati Ikhulafa". Allah made it easy for me the research and study to introduce to this historian, and the system he followed in his book of the considered able importance to be as one of the fragrant prophetic tradition and Islamic conquests in the age of the first three orthodox caliphs, whereas I dealt in this research Abi Al Rabee' Suleiman Al Kula'I as to his life, sheikhs students, and the story of his martyrdom. Then, I dealt with his compositions, his above mentioned book, his most important sources followed by the most important public characteristics of the system be followed. ABSTRACT Meeting of sciences on one hand and techniques on the other together at the point of the contemporary point of advancement i.e. ( a piece of information, and special technique) gave the geographical information system (GIS) and remote sensing (RS) the power and innovation whereas they became one of the most important devices to manage the city ; the municipal councils controlled over social services, communications net, housing, and etc… This study requires knowing the range of area and constructional variation of Tikrit city since 1920-2010, depenanece will be different maps of this period of time besides the space visible things, then making compassion, also knowing the pattern and direction of this development, controlling factors, computing thee way of development extraction of its pattern and the direction of its expension under the integration of information and technique. ABSTRACT In most of the legislations and laws, it's known that increasing in the constructional expansion is the result of the number of population. Whether this increase was resulting from the normal increases or the immigration ; this indicates to the rising in the economic and educational levels of the population in the city, or in villages and country side. But this expansion is of certain negatives representing in the constructional creeping on the agricultural lands which, in turn, leads to exhaustion of the arable lands which are regarded as the main source for the diet of population ; than this study aims at throwing light on the stages of the constructional expansion at the center of Al-Haweeja province, and knowing the geographical characteristics to limit the directions of the constructional expansion within the range of the study. The constructional movement has developed as a result of the income increase. The purpose of this study was to submit proper solution of the constructional creeping problem on the agricultural lands and direction towards the non-arable lands through limitation of the locations of these lands, they to make use of them in building ; moreover what has happened through yes/no balance between the extension of housing and utilizing of lands for agricultural purposes. Research Summary Current research aims to (content area calendar math book for the fifth grade in the light of scientific standards TQM) and the problem of study identifies the following questions: 1 - What is the area of quality standards math book content for fifth grade science? 2 - What is the achievement of quality standards in the field of math book content for fifth grade science? To achieve the objectives of the study, the researcher used the descriptive survey method approach to his research. The research community of teachers and teachers who are studying mathematics to fifth grade science in the province of Salah Al-din, totaling (205) teacher and a school, and chose researcher proportion (51%) of the original community, and the total sample (105) teacher and school researcher used a random sample in that. The researcher prepare quality standards content area math book for fifth grade science through studying the literature of education and modern standards and previous studies by approaching the current study and American standards for math, and consisted resolution in its initial (3) standards and (26) an indication of belonging to the content area math book, and to ensure its sincerity was presented to a group of experts, after the deletion, and modification and integration became a questionnaire consisting of (3) standards and (24) an indication of belonging to the content area math book, and was sure to force discriminatory indicators and the stability of the questionnaire, the researcher used the means of statistical the following: Chi square, and Pearson correlation coefficient, and the weighted average, the weight percentile, the researcher reached several conclusions, including: 1 - that most of the quality standards in the field of content available math book. 2 - that the quotas for the content of the book is not enough to cover the material vocabulary. 3 - it is not the content of a book of mathematics is related to the environment surrounding the student. Based on the data the researcher developed a set of recommendations, including: 1- increase the number of quotas to the content of a book of mathematics for the fifth grade science, and commensurate with the size of the book and its themes. 2 - When authoring math books need to make the content of the book is linked to the environment surrounding the student. ملخص البحث يهدف البحث الحالي الى (تقويم مجال محتوى كتاب الرياضيات للصف الخامس العلمي في ضوء معايير الجودة الشاملة) وتحدد مشكلة الدراسة بالاسئلة الاتية: 1- ما معايير جودة مجال محتوى كتاب الرياضيات للصف الخامس العلمي ؟ 2- ما مدى تحقق معايير الجودة في مجال محتوى كتاب الرياضيات للصف الخامس العلمي ؟ ولتحقيق أهداف الدراسة استعمل الباحث المنهج الوصفي المسحي منهجا لبحثه. تكون مجتمع البحث من المدرسين والمدرسات الذين يدرسون مادة الرياضيات للصف الخامس العلمي في محافظة صلاح الدين والبالغ عددهم (205) مدرس ومدرسة, واختار الباحث نسبة (51%) من المجتمع الاصلي, وبلغ مجموع عينة البحث (105) مدرس ومدرسة واستخدم الباحث العينة العشوائية في ذلك. قام الباحث باعداد بمعايير جودة مجال محتوى كتاب الرياضيات للصف الخامس العلمي من خلال اطلاعه على الادب التربوي والمعايير الحديثة والدراسات السابقة التي تقترب من الدراسة الحالية والمعايير الامريكية للرياضيات, وتكونت الاستبانة في صورتها الاولية من (3) معايير و (26) مؤشرا تنتمي الى مجال محتوى كتاب الرياضيات, وللتاكد من صدقها تم عرضها على مجموعة من الخبراء, وبعد الحذف والتعديل والدمج اصبحت الاستبانة تتكون من (3) معايير و(24) مؤشرا تنتمي الى مجال محتوى كتاب الرياضيات, وتم التأكد من القوة التمييزية للمؤشرات وثبات الاستبانة, واستخدم الباحث الوسائل الإحصائية الآتية: مربع كاي, ومعامل ارتباط بيرسون, والوسط المرجح, والوزن المئوي, وتوصل الباحث الى عدة استنتاجات أهمها: 1- أن اغلب معايير الجودة متوفرة في مجال محتوى كتاب الرياضيات. 2- أن الحصص المقررة لمحتوى الكتاب لا تكفي لتغطية مفردات المادة. 3- لم يكن مجال محتوى كتاب الرياضيات يرتبط بالبيئة المحيطة بالطالب. وبناءً على المعطيات المتقدمة أوصى الباحث بمجموعة من التوصيات أهمها: 1- زيادة عدد الحصص المقررة لمحتوى كتاب الرياضيات للصف الخامس العلمي, وبما يتناسب مع حجم الكتاب وموضوعاته. 2- عند تأليف كتب الرياضيات ضرورة جعل محتوى الكتاب يرتبط بالبيئة المحيطة بالطالب. Abstract Current research aims to identify) after mental map of the fifth in the collection of the students in the literary material rhetoric and tendency towards it). To achieve the objective of this research chose researcher determined experimentally The two unequal one control group studying rhetoric in the traditional manner, and the other experimental group taught Rhetoric manner mental map, prepared researcher test is characterized by honesty and steadfastness and applied to the students of the two groups, as well as a measure of its preparation for measuring the tendency of students towards rhetoric, and randomly picked, fifth grade literary preparatory Baiji in Salahuddin province to be the experimental group, and fifth grade literary preparatory Interface Language to be the control group consisted sample of (51) demanded by (31) students of the experimental group and 20 students for the control group, rewarded Researcher between the two sets of research in the following variables: 1. Chronological age measured in months, 2. Degrees Arabic for fourth grade year for the academic year 2011 - 2012, 3. Educational attainment of the parents, 4. Intelligence, 5. Inclination. After the end of the probation period, the researcher to: The result: the experimental group than students who studied mental map strategy on the control group students who have studied in the traditional way was difference is statistically the level (0.05). ملخص البحث يهدف البحث الحالي إلى تعرف: (اثر الخريطة الذهنية في تحصيل طلاب الخامس الأدبي في مادة البلاغة وتنمية ميلهم نحوها). ولتحقيق هدف البحث اختار الباحثان تصميماً تجريبياً ذا مجموعتين متكافئتين إحداهما المجموعة الضابطة تدرس البلاغة بالطريقة التقليدية, والأخرى المجموعة التجريبية تدرس البلاغة بأسلوب الخريطة الذهنية, وأعد الباحثان اختباراً يتميز بصدقه وثباته وطبقه على طلاب المجموعتين, وكذلك مقياساً من إعداده لقياس ميل الطلاب نحو البلاغة، واختار عشوائياً، الصف الخامس الأدبي في إعدادية بيجي في محافظة صلاح الدين ليكون مجموعة تجريبية، والصف الخامس الأدبي في إعدادية أبوعبيدة ليكون مجموعة ضابطة وقد تألفت عينة البحث من (51) طالب بواقع (31) طالب للمجموعة التجريبية و(20) طالبة للمجموعة الضابطة, كافأ الباحثان بين مجموعتي البحث في المتغيرات الآتية: 1. العمر الزمني محسوباً بالشهور، 2.درجات اللغة العربية للصف الرابع العام للعام الدراسي 2011- 2012, 3.التحصيل الدراسي للأبوين, 4. الذكاء،5. الميل. وبعد انتهاء مدة التجربة, توصل الباحثان إلى: النتيجة: تفوق طلاب المجموعة التجريبية التي درست بإستراتيجية الخريطة الذهنية على طلاب المجموعة الضابطة الذين درسوا بالطريقة التقليدية في تحصيل مادة البلاغة وميلهم نحوها وكان الفرق ذو دلالة إحصائية عند مستوى (0.05). Hala Farouq Muhammed University of Mosul College of Basic Education English Department	ABSTRACT Lexical borrowing is a common process across languages. Even so, words borrowed into a language are rarely borrowed perfectly, but instead undergo modification vis-à-vis their realization in the source language (SL) from which they were borrowed. This process of modification may result from the influence of the phonology of the borrowing language (BL). This paper is a study of the phonological adaptation of English proper names used by announcers on Iraqi channels. A corpus of (25) English loanwords is analyzed. Thus the adapted forms are compared with their corresponding models (i.e. English loanwords) at consonantal and vocalic levels. Because adaptation of words involves a comparison of the phonology of both original and recipient language (RL), a brief description of the phonology of Standard English (SE) and Standard Arabic (SA) is taken into account. In this study it is hypothesized that the adopted forms of these names show many cases of adoption since announcers on channels for prestige motivation, try to pronounce the names as they are used in their original language, viz. English. ABSTRACT Experience in teaching English and previous findings show that learners confront acute difficulties very often in finding solutions to the commonest ambiguities whether in speech or in written language. Such difficulties stand strongly against learners' ability to understand an ambiguous sentence or a vocabulary item. The reason which has driven the researcher to write this paper is to highlight the notion of ambiguity posed in English trying to help learners lessen and overcome the difficulties which may be come across in everyday life by displaying the commonest ambiguities that exist in the English language. In so doing, the learners can find the research subject-matter helpful to increase their experience in this respect and pay more attention when they face such ambiguous constructions or words. The procedure to be followed in this research is to present the available literature relative to ambiguity whether intentional or unintentional. The researcher adopts a procedure of comments and analyses of spoken and written ambiguities which frequently appear in the language. However, conclusions are arrived at after thorough investigation of the topic. The degree of difficulty a learner of English faces when using an ambiguous sentence or a word by a speaker of English depends largely on the learner's educational level and whether he is an experienced learner or he is still at beginning stages. Some expressions and sentences, indeed, bring about ambiguity which are hardly understood, but by keeping contact with English speakers, ambiguity can be decreased. ABSTRACT In 1981, two linguists, de Beaugrande and Dressler, say that every text should have seven criteria to be said as a meaningful and complete text. These criteria are concerned with the meaning and structure of the text. They are cohesion, coherence, intentionality, acceptability, informativity, situationality, and the last one is intertextuality. Some of these criteria are user-centered, while the others are text-centered. This study investigates the seventh criterion which is intertextuality. It tries to investigate the intertextual relations that can be found within texts. It aims at finding how a text is built and constructed, how more than one event and text are integrated within one text, and for what purposes addressers tend to use prior texts in their new texts. The study is an analysis to James Joyce's 'Eveline' as a sample text in terms of the standard of intertextuality. It shows the main types and meanings of intertextuality adopted by de Beaugrande and Dressler (1981) and Genette (1992). It gives a scientific and systematic way of analyzing texts in the perspective of intertextuality and this enables students to know how a given text is built and constructed. Finally, the study will be put in the limits of discourse analysis field.